Description: The Spyderco Puukko is a classically designed Puukko knife, which is a Finnish utility knife, “developed for life in forested, outdoor environments where woodworking, hunting and fishing are daily chores”. Beautifully crafted piece here by Spyderco, with a mini Spydie hole to retain its Spyderco Heritage. 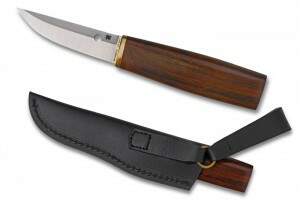 This entry was posted on Friday, March 30th, 2012 at 2:12 pm	and is filed under 3" to 4" Knives, Designer - Pekka Tuominen, Handles - G10, Handles - Wood, Manufactured - Taiwan, Steel - CPM-S30V, Type - Ethnic Series, Type - Fixed Blade, Type - Outdoors, Type - Utility Knives. You can follow any responses to this entry through the RSS 2.0 feed. You can leave a response, or trackback from your own site.